By the way, the timing of these learning log posts does not relate to the timing of when I do the work! I am actually way behind on posting updates on my progress so I am trying to catch up. – vary the distance between lines so the background plays a part in making the colours appear to change. Here is my work; a bit planet like I think! I kept to the brief of using black fabric as the background and two primary colours. I varied between light and dark versions of the colour and used a mixture of wool, cotton and silk threads as the amount of sheen they have alters the impact of the colour as well. I used running stitch, couching, chain stitch, satin stitch and some needlelace stitches for these samples. The amount of background colour appearing has a big impact on the colour but more if the thread colour is light rather than dark. 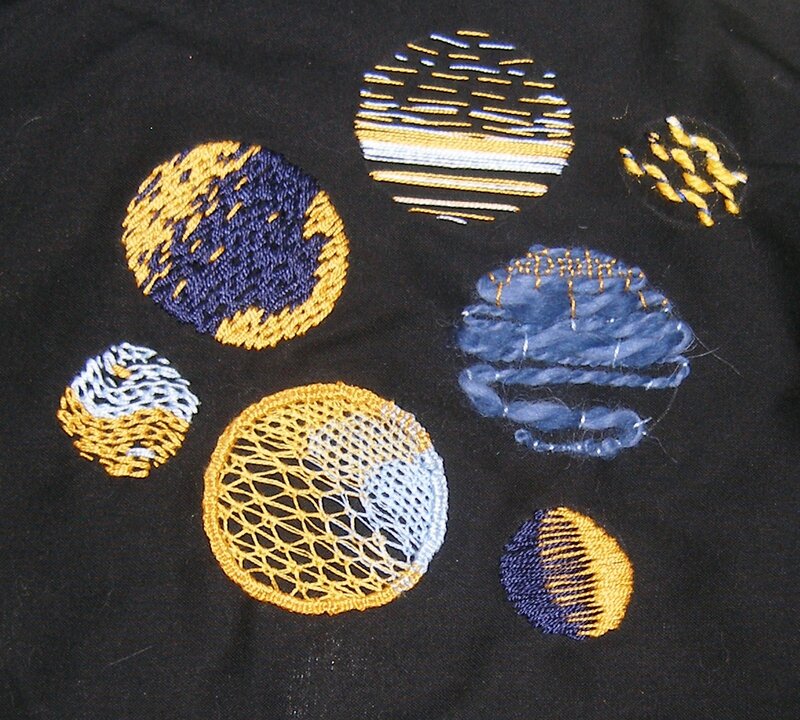 For example, in the large circle with dark blue thread in the centre and yellow at each side, the unstitched areas amongst the dark blue thread do not show that strongly whereas in the needlelace large circle in the lower part of the sample (with the buttonholed edge) the black fabric is quite a dramatic background to the yellow and makes the yellow really stand out in high contrast. Blending the colours in the centre of a circle softens the transition between colours, as in the needlelace example and the satin stitch small circle lower right. The movement from one colour to another is not harsh and a softer effect is produced. Compare this to the yin/yang small circle on the left, where although the colours are both pale, there is no blending between them. Instead there is a sharp line and a clear division, each colour remains complete in itself. The colours in the yin yang are only broken by a small isolated dot of the opposing colour and this acts as a link between the two halves. In the couched example with blue wool, the eye is drawn to the area of close stitching near the top with the contrasting colour before the eye travels down the piece to the lower section which has a softer feel without the contrast stitching.